A few weeks ago, my husband said the sweetest thing to me: “I hate our kitchen.” And, I officially got the green light to start our renovation. Glory, hallelujah! A big island with lots of workspace and some seating. More pantry space and dish storage. A built-in breakfast nook with plenty of seating. Better storage for pots and pans. For those of you who have been through a kitchen renovation, let me know what else I should consider. I don’t want to miss anything and be sorry later. And, I’m curious to hear how you survived without a kitchen. The contractor I met with estimated 8-10 weeks for completion and about five weeks without a kitchen at all. (!!!) That’s a lot of sandwiches. . . I haven’t done a remodel . . . but I moved in the last year and both my kitchens have been great, but very different. What I miss most about the old kitchen is the appliance garage and my fridge with the freezer on the bottom. What I love most about the new kitchen is having a second sink and disposal in the island and a chest of drawer we use as a beverage station for the coffee maker, Soda Stream, drink mixes, mugs, etc. Hi Emily! I am still waiting for my husband to say “it’s time” for our kitchen Reno ? 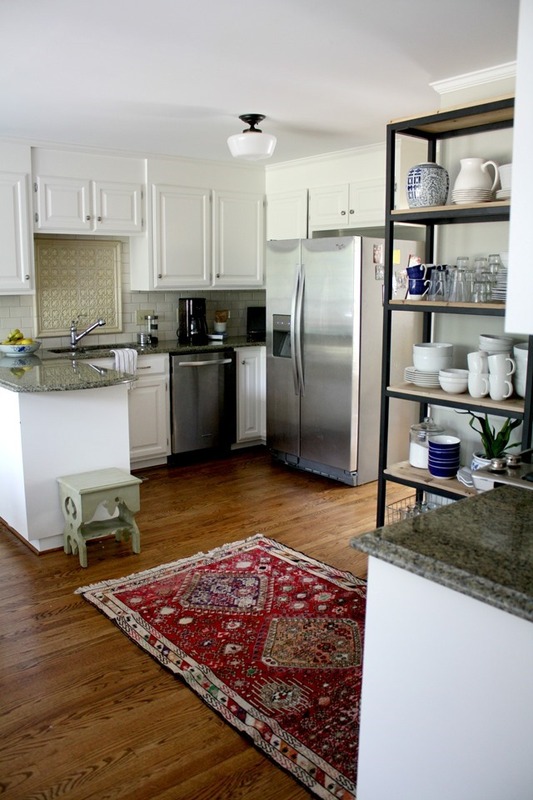 so I have no advice, but Kate over at Centsational Girl wrote a great post last September on her kitchen remodel–10 Lessons. Good luck and I look forward to living vicariously through you as you embark on this exciting project! So exciting! I remember how thrilled I was when my husband agreed to renovating ours! We went from having a peninsula to an island – my biggest must-have! I also had to have a pull out garbage. I actually ended up with two! I have one by the sink and one in the island. We also did a spice drawer and a knife drawer. I still haven’t gotten used to the knife drawer. I think I prefer having knives in a knife block where I can just grab one, but I am still getting used to it. We went with a big 48 inch stove instead of a cooktop and wall ovens. I obsessed over that decision for many months because I was afraid it would be a pain to bend down when I was used to wall ovens. I ended up being thrilled with the big stove and even on Thanksgiving, the bending down didn’t bother me. I feel like a ‘real’ cook now with that thing! I love your idea of two dishwashers…especially when you are entertaining. I wish we did that! Go for it! Can’t wait to see what you do. Best of luck! My parents just finished building a house, which we got to enjoy over Christmas, and some of my favorite features were: a large island (with nothing much but a sink at the end – gives so much work space or “buffet” space), second sink – was nice with lots of people for an extra spot to wash hands, wash produce, etc., but definitely a luxury/not a must, and the very favorite was a “sonic ice” machine/soft ice – it was the most used appliance! The worst thing was the touch faucet – very faulty and would randomly shut on/off, so no need to get fancy with the faucet! I love all the inspiration photos!!! A large island is a must. I love having it for entertaining. We also have the pull out trash and recycling bins and it’s so nice to have them stored away and out of sight. If you figure out some awesome way to store pots and pans let me know, because that’s totally on my list of things I want to update. Also, our friends have a drink fridge in their home and it seems like this weird luxury item but it’s so practical. Especially since you have kids they can grab their own items. They stock it up for when we have small group meetings at their house and it’s a nice dedicated spot for drinks. I can’t wait to see how your kitchen comes together. Will be following along as you plan. We did one pre-kids. So that made life a little easier. But it was a very small house. Our frig went in the dinning room and use a toaster oven. If I had to do one now (and desperately want to do one) with kids. I would make some meals to freeze ahead. Use the crock pot and toaster oven. Set up a mini kitchen in your garage or sunroom. Paper products will be your best friends. Must haves in a kitchen. Pantry cabinet, beautiful and bright lighting, softcose drawers and a garage disposal. I grew up with two dishwashers in the kitchen. My parents designed it when they had three kids and ended up with seven years later. The double dishwasher saved us all and I would highly recommend making it a priority! It’s on my list of dreams as well. Oh yeah, having two of those would have saved us too. I have 3 brothers and sisters but with my grown up brother and both his kids living next door and eating with us every day there was always a LOT of dishes. I love my kitchen but sadly there is no tall cabinet to house my broom, so I have to keep it in the garage. Just think about all the things you use everyday. Cannot wait to see what you do…. How exciting! I can’t wait to see the final result. I have been living through just a master bedroom and bathroom repair after a tree fell on our house and that has been enough to tell me that if I ever remodel a major space like the whole kitchen that I am moving out – or at least will fantasize about moving out. But we don’t always have that luxury. Good luck. I would suggest stocking up on gift cards for restaurants to save your sanity on the worst of the days. You will get through it. I’m excited for you. I have a co-worker who built a house years ago. Her designer told her to add a warming drawer. It ended up being one of the best items in the kitchen. It was nice when the kids had varying schedules with after school activities, the kids knew to go there and get something to eat and it stayed warm. Pull out shelves, pull out shelves, and more pull out shelves! I can’t stress having plenty of pull out shelves. (Like the ones in your Heather Bullard and BHG pictures.) I had some put in when I did my kitchen reno but I underestimated how much I would love them and how much extra storage they provided. Now I wish all of my lower cabinets had pullout shelves instead of just a few. That’s about the only thing I wish I had done differently. These long, drawn out kitchen renovations by professionals that take many weeks, or even months, completely baffle me. Why? Whole houses can oftentimes be built in six months so why does it take 2 or 3 months for someone (who renovates kitchens for a living) to complete a kitchen? I had my kitchen completely gutted and custom-built cabinets installed and my kitchen was only out of service ONE WEEK. Admittedly, I worked within the footprint of my original kitchen and didn’t tear down any walls but I did have a pony wall built and relocated the placement of all the appliances to make the kitchen more efficient. My cabinetmaker (a local guy who is in business for himself and had just 1 helper) came in and took a million measurements first. Then he went back to his shop and built all the cabinets from scratch and fabricated the solid surface (LG) counter tops. When the cabinets and counter tops were done, only then did he come and demo my old kitchen (on a Friday). On the following Monday, he built the pony wall between the family room and kitchen, and started installing the cabinets. By the end of the day Wednesday, he had all the cabinets and counter tops done, and the crown molding installed. Thursday he laid the kitchen floor and installed the appliances. Friday, just one week after gutting my old kitchen, he was done and gone, and I was putting things away in my new kitchen! He did an awesome job! All of his pre-demo measurements were spot-on and the kitchen went back together quickly and easily. I consider myself picky but his attention to detail far surpassed mine. (I wish I could include before/after photo here.) Since we were only without a kitchen for 1 week, it was no problem to set up a makeshift kitchen in the laundry room with the microwave and toaster oven but I cannot imagine having to worry about how to prepare meals for a family of 7 without a kitchen for weeks on end! 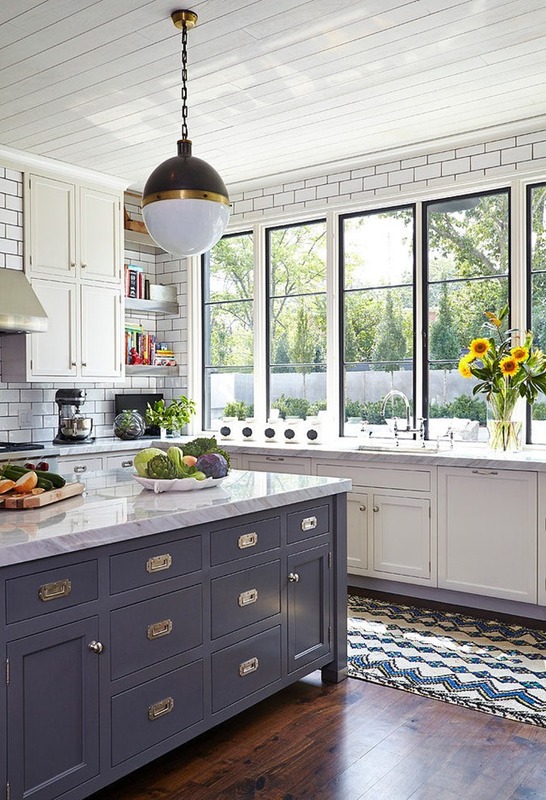 Personally, if it were me, I’d talk to another contractor (or two, or three) to see if someone could complete your kitchen reno in a more timely manner. I imagine there were no electrical or plumbing changes. I noticed with my remodel we lost a couple of weeks just waiting for the inspectors to come and sign off on the work. Frustrating but necessary to get everything permitted and inspected. 1.deep pull out pantries: I have 2 36in double door pantries, like in your picture. I HATE having to open both doors to pull out a drawer. They would be ok if split down the middle with smaller drawers. 2. If possible, try to get a view of your backyard (or wherever your kids play) I have gorgeous sweeping views, but because of the window placements, I can’t see the area I could potentially put play equipment. 7. We have a sunroom at the end of the kitchen and I LOVE having a lounge area in the kitchen…my daughter hangs in here while I cook do/dishes, and my husband will relax on the sofa while I cook. It’s great! I don’t know if it is a need, but I really like our touch on/off faucet. I think no matter what it is going to be hard to be without a kitchen. Rather than eating out and when we got sick of sandwiches and pizza, I would buy premade food from Whole Foods. While not inexpensive, it is less expensive than eating out and more healthy. Good luck! Can’t wait to follow along on the journey. We remodeled our kitchen about a year ago. We did parts of it ourselves, so it took longer than usual (about 6 weeks with no sink or oven). Be prepared to eat lots of sandwiches, take out, and microwave options. :) It’s totally worth it though. The best thing we added was definitely our drink fridge and snack station. With our own 3 kids, plus neighborhood friends coming in and out all of the time, it’s nice to have the extra storage and a place for them to grab something quick. Tip — Once you figure what type of knobs, drawer pulls, and faucets you want, check Overstock.com before buying them somewhere else. They have a big selection! I saved a lot of money ordering from there and I was very pleased with the quality. Really plan electrical outlets. We didn’t really change any during our reno. All our outlets are on the walls between the counters and the upper cabinets. Wish we had some lower and on open walls for the ability to add lamps or holiday trees, laptop charging or little space heaters, for example. have fun! Your kitchen wishlist is pretty much the exact same as mine! I would add double ovens for sure. 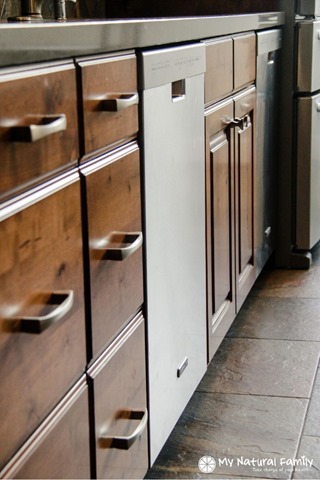 I also really want more cabinets–thinking stacked to the ceiling kind of look. I LOVE the idea of an appliance garage, such a must-have for toasters and blenders and things I want out on the counter but want to hide. My in-laws built a huge house two years ago and I love their “sonic” ice maker. She also has a second small sink in the island which is nice and a pull-out spice rack that is hidden in the range hood. Oh! 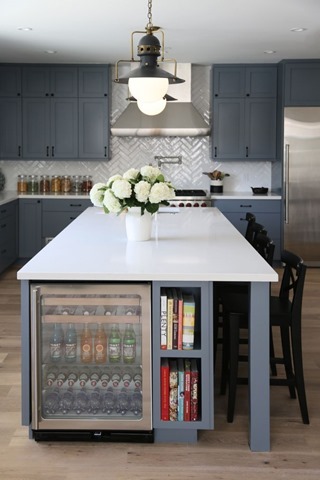 I also love the look of dishwashers and fridges with custom panels to match the cabinets (I get tired of cleaning stainless and don’t like anything else). Still trying to get my husband on board for that one….splurge for sure. Last thing….my in-laws have a larger breakfast “nook” that has a table and then also some nice arm chairs and a tv in some built-ins. I absolutely love it–they cook a lot and that is the “hang-out” spot in the house–great for talking and playing….we never even go into the living room! How exciting! On not having a kitchen while you remodel, I always suggest setting up a “camping kitchen” in the garage–refrigerator, toaster oven & microwave and a long folding table will help tremendously. Under cabinet lighting! We have dark brown/black quartz (which I love) but without the under cabinet lighting it is difficult to see well especially at night. I also like the way the lighting gives a warm glow to our kitchen at night. Yay! I’m so excited for you! 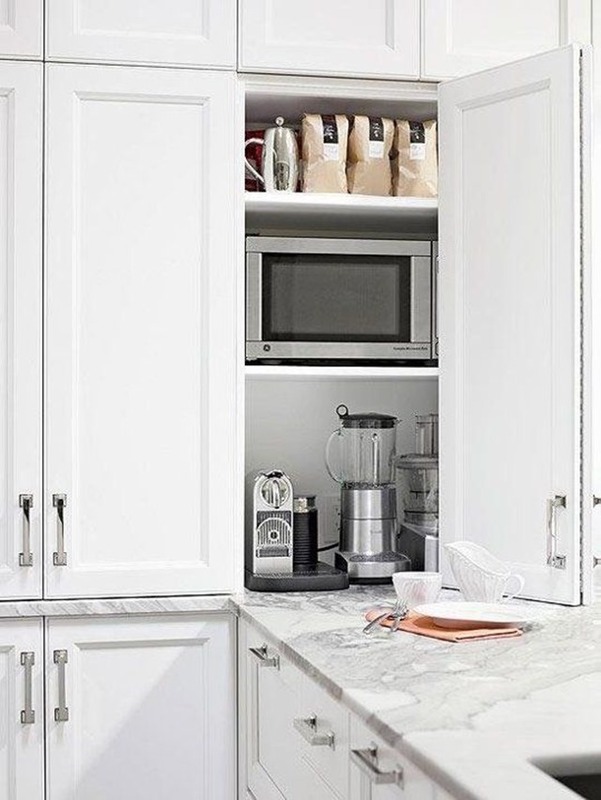 I was reading your post about the open cabinets last night and wondering how you survive in your awkwardly-laid-out kitchen with your large family. We will be renovating our kitchen (also awkward) in a year, so I can’t wait to see what you do with your kitchen. The comments here are super, I will have to pin this so I can find the ideas later. 2 dishwashers are a must! We just built a new home, I thought I would be happy with just 1 dishwasher, there was space for 2, so I said, sure, “why not do 2 dishwashers!” Best decision EVER! Maybe do 2 islands if there is room, I’m seeing that more and more. If the island is too large, it is hard to clean or get things in the middle. If you do a small sink in your island, put in a disposal, you’ll need it for sure. That is my kitchen regret. I’m so glad we didn’t do hardwood in our kitchen. We had always had it in our previous homes, so I was really nervous to not put it in, but for the new home we chose the brand, ‘Quick Step’ with lots of color choices, it was affordable, it looks like good quality, and everyone compliments us on it, plus we can spill lots on it, mop it up easy, and kids can drive toy cars on it, roller blade (it happens), etc. and not worry about scratches. We also have a pool out back, so kids can come in drippy and I don’t yell about the wet floor. Be careful of appliance packages in the same brand. For ex/ we got the bosch package- Great Dishwashers, strongly dislike our ovens and range. Bosch makes bad ovens, which we found out later. Love having double ovens though. Our range needs a light to warn us when we accidentally walk away when the gas/flame was left on low. Look into a hands free or touchless kitchen faucet, you don’t have to touch faucet handles with messy, gooey, sticky hands! Love this concept. To save money I stained my kitchen cabinets grey. I don’t like the result, I should have paid the extra to have them painted. 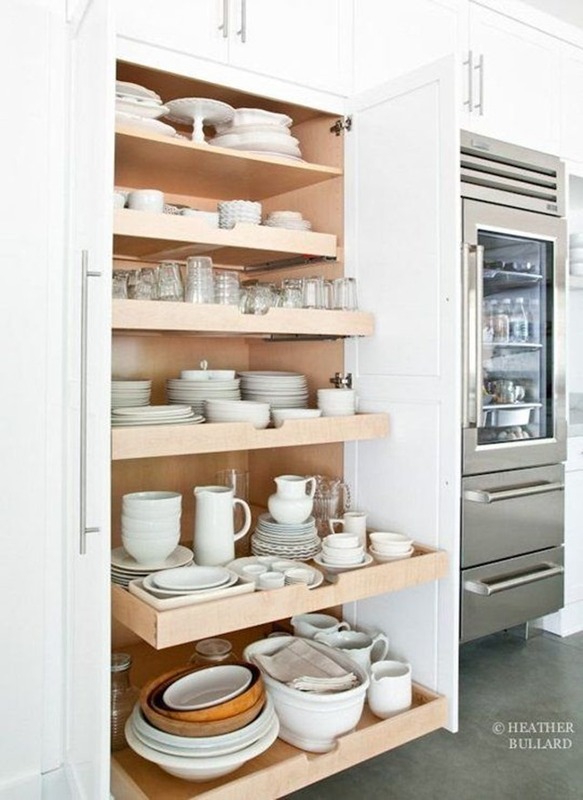 I would like to have had one wall of our upper kitchen cabinets be a wall of open shelving. Husband nixed the idea, but I regret I didn’t encourage that more. My kitchen is all cabinet, we need a place to rest our eyes. Or even an empty wall for a painting, or picture, or large family calendar or paper command center, etc. We did our upper cabinets all the way to the ceiling, without little windows or spaces on top. I haven’t liked that look too much. Good Luck, No advice for living/cooking when it’s being done, Get a camper! LOL! Thanks for a great blog, by the way. Love your content, post, and writing! The Best! Thanks for the recommendations. I haven’t heard about the Quick Step flooring but will look into it. Also, did your husband happen to be trying to get something out of the freezer while the dishwasher was open when he made that comment? We have the same problem in our kitchen! Who designs these things???? Oh, that corner gives us both fits! 1) Counter-depth fridge (put a second fridge in the garage). A larger fridge just looks like a elephant in the room…. always. 2) Walk-in pantry (if you can swing it). We have all our appliances on one side and all the food on the other side. It keeps the counters free of clutter. 3) Pull out trashcans — just like your picture. 4) Upper cabinets that sit on the counter that have glass on the front. It looks somewhat like a hutch or china cabinet. We put the dished we use daily here and it has been so handy (and it looks fabulous). 6) We made our island big (Probably 60″ by about 112″). We have seating for five around one short side and two-thirds of the way down the long-side. Under the seating on the long-side, we have 12 inch deep shelving for holiday dishes. At the end of the long side, we have deep pull out drawers for storing large and odd size serving pieces. It is so easy to access but hidden for daily use! Love it! (Just be sure to keep your island smaller than a slab if you are planning to use a natural stone for the counter. It will keep you from having a seam on your island). 7) We have a second, small prep sink that we rarely use. I would say a prep sink is not a “must” item. 8) LED under-cabinet lighting! Love it! Good luck! I can’t wait to see the progress! I’ll counter the suggestions for deep pantries. Doesn’t matter how careful you are, or how good the rollouts are, things will be lost. And based on my build several years ago they are excessively expensive. So I have one wall completely outfitted with 42″H x 30″W x 12″D wall cabinets. The wall is opposite the work area, more in a walkway space across from the island. They are ganged together 2 high (9 ft wall), placed on a plinth, and provide excellent access to food items, infrequently used appliances, and extra dishes. 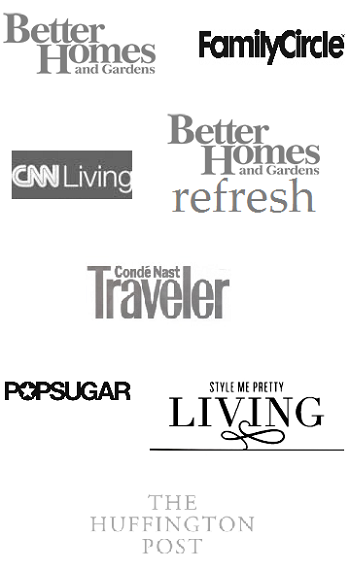 I love them and so do my guests – they’ve been copied more than once! Hi Emily, I’ve personally done 3 of my own kitchens, plus I used to do kitchen and bath design. You’ve lived with an island before so you know the pros and cons (I like to call it the roller rink effect) of islands. You have lots of good ideas/suggestions in here…I second the second sink, the electrical plan and paying attention to the lighting. When you plan your cabinets, think about “zones” – snack zone, beverage zone, baking zone, craft zone, etc. That will really help you figure out the “bells and whistles” – those rollouts can add up quickly. Try to avoid deep pantry cabinets – they are awkward and you don’t really use that space in the back. For your family, I would seriously consider trying to fit in a full sized fridge next to a full sized freezer. You’ll get the side by side built in look but get so much more room. If you are a tea drinker, consider an Insta-Hot at the sink – gives instant hot water (a little luxury). Finally, your costs are really going to come from your cabinet construction…some of your inspiration pics show inset cabinets (they fit right into the frame). Those are much more expensive than overlay (the door sits on top of the frame). Insist on dovetailed drawers and plywood shelves – they will hold up. Watch out for the add ons – paint, glazes, corbels, moldings – that is where the expense comes in quickly. You can get a high-end look with just a few touches…and you run less of a risk of looking dated. And don’t forget countertops when you do your budget (I know you won’t). 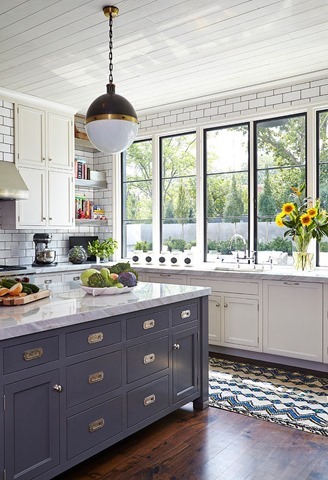 Backsplashes are a much cheaper way to add interest to the kitchen than cabinets or countertops. Have fun! I should add for surviving a remodel. We always did ours in the summer so we could use the grill and the patio furniture. You can go a long way with a micro. Also, we pulled out our camp stove a lot (and our grill has a burner as well). Washing dishes were in our big beverage tub. We just fill it up with water and soap and then you can carry it into the shower to rinse off (I know it sounds silly but it works really well). You can also negotiate with your contractor on the placement of your fridge, and they don’t need to disconnect your sink until right before they do plumbing or install cabinets if you aren’t moving the plumbing. Meals aren’t too bad if you grill…hamburgers, hot dogs, chicken, pork chops…we even made pan pizza which you can do right on the grill. Steamed veggies in the micro and lots of salad. And this is not the time to be environmentally friendly – it’s OK to use paper and plastic. It’s worth the sanity it saves. I just finished our kitchen renovation. We did a kid drink fridge area (out of my cooking triangle) with a kids pantry. Basically, I hate making lunches every morning. So I set up a lunch making area. It has all their lunch stuff together so I literally do not have to move around the kitchen to assemble lunches every morning. Turns out they also utilize it right after school for snack time too. The baby (2) even knows how to help himself. Everyone has become more self sufficient. I also have big plans to train the older two boys to pack their own lunches next year! The other thing is the trash area. With 3 boys, we make a lot of trash. Our last little pull out thing bit the dust and was always broken or stuck because the boys over stuffed it. Now I have a walk in pantry (not huge at all) that has my full size trash can (same one that Sweet Frog has) just sitting off to the side. Out of sight, but easily accessible and the size we need. Appliances. Cooktop. Six burners is a must. I also LOVE my 48″ fridge. I know that is crazy sounding since I also have a beverage fridge in my kitchen. It might be my favorite thing about the whole kitchen. New dishwashers are not made like old ones. Get 2 Bosch and call it a day. I have had 6 dishwashers in 15 years (i know its sick) and Bosch is the best. Living without a kitchen…I set up a fridge, microwave and crockpot and Kuerig station in my dining room. I would use your open shelf and put it next to the fridge and fill the bottom two shelves with snack baskets and the next shelf with plastic utensils and paper plates and top shelves with pantry items you need for crockpot and microwave meals. Seeds of Change Organic Quinoa and Brown Rice with Garlic microwave pack saved my life. Have fun!! Can’t wait to see it all come together!!!! Drawers! I renovated the kitchen in our last house and replaced several lower cupboards with deep drawers (on full-extension glides) for pots, pans, storage containers, and baking supplies. We had a pipe burst, horrible contractor, and were without a kitchen for 5 months. Frozen waffles and sandwiches were our staples. BEST things in our new kitchen are one large sink, drawers rather than bottom cabinets, soap dispenser and air switch for disposal, right next to faucet. CONSIDER: our corner appliance garage isn’t really big enough to hold all appliances so I just use it to hide rags and dish towels. Also, our microwave is on level with upper cabinets, but with trim kit it’s really hard to reach. Good luck! My parents did a major summer kitchen renovation also with 5 kids. My mom set up a backup kitchen in the basement with the extra fridge, toaster oven, microwave and an electric griddle (can frequently find these at thrift stores if you don’t have one) and an electric pot. Dishes were washed in the deep sink, and I’m sure we used lots of paper plates. You could also look into a hot plate. We ate lots of dinners at the pool that summer, but I don’t remember eating much takeout or fast food. Also, as a kid, we were totally unfazed by the challenges, so your kids will probably roll with it just fine. Stock the freezer ahead of time and you’ll get through it! -Not having enough outlets. There is only one outlet in the island, but it’s at floor level and my appliances won’t reach. -Pull-out drawers are better than pull-out shelves. With shelves, everything has to be stable to withstand the jostling, and can’t utilize all the space to the edges. With drawers or standard shelves, you can stack things more easily and place things all the way up to the sides or lean things against the walls. Completely agree about drawers. And I would put as many drawers in as I could. I can think of nothing that I have in a cabinet that wouldn’t be more accessible in a drawer. Emily, I wish your husband could talk to mine ; ). I re-design my kitchen in my head (and sometimes on paper) almost every day. I think he’s getting there. I am excited to see this unfold for you and learn some valuable tips along the way. Some of you commenters sound like you have drool-worthy kitchens. I would love to see them! We have been through two kitchen renovations! Fridge/micro/coffee in dining room, a tent over the bbq in the back yard and a electric hot water (thing?) are your best friends. Two most important other than the island and appliance placement … lighting. Once you get your layout make sure you have all the task and decorative light you want. Our first I didn’t do such good job and was super frustrated with myself later. AND if you can/have room put some nice chairs or small sofa to sit on… everyone ends up in the kitchen and I have friends that put comfortable and stylish seating (other than dining chairs) in their kitchens and everyone loves it. They get used more than the family room! So exciting to get a new kitchen! So NOT exciting to live with 5 kids without a kitchen! We lived without a kitchen with 4 kidlets after we were totally scammed on our home remodel. (He left us high and dry right after they demolished the kitchen.) For a couple of months I was in shock, we lost so much money. I think we ate at Costco for 5 days straight, and then Subway and frozen meals. After I came out of my coma, I decided we needed our health to live through it, so I borrowed kitchens once a week and made as much as I could for the week, limiting eating out to (healthy) Pizza Friday. I sometimes would go to our church’s kitchen during the week and set up a table with a table cloth and flowers just to feel calm and so my kids didn’t get a frazzled mom all the time. We ended up with a beautiful kitchen after 8 months, and I love it! My favorite things are a trough vegetable sink in the island (it doesn’t take as much room as a square one), our four-bin trash/recycling pull-out, under counter microwave (we put in a drawer microwave..love it! No bending down! ), under cabinet lighting, and enough space for us to eat at the island if we wanted to. I wish I would have put in more outlets and hidden them, and made a couple cabinets deeper (cabinet maker talked me into shallow declarative cabinets). But really, it’s a great kitchen that functions well with lots of kids and for parties. So I guess my best advice is…the thing that will make it less of a hair-raising experience is to keep some semblance of normalcy for the kids. Then they aren’t freaking out, which means, you will be freaking out less! What a nightmare! Glad you’re back in your kitchen. I have never renovated and I dream of a new kitchen! My biggest dream is to take the appliance garage one step further. I’d love to have a walk in pantry with a counter. On that counter I would place my bread machine, mixer, crock pot, blender, and any other appliances (toaster and coffee pot would probably be in the main kitchen area still) that I might use at any given time. THey would sit on the counter, unplugged, but at the ready for anytime I’d like to use them. I HATE digging those things out when I want to use them. I would love that, too! I might hide in there. Lots of great ideas here! We’re in the midst of building a new house and thinking about lots of these things too. My dad is a woodworker hobbyist and built all of the cabinets in our current home. We ended up doing almost all big drawers on the base cabinets and I LOVE THEM! I have two standard base cabinets because I was worried that the drawers wouldn’t be that great but in the new kitchen I’ll probably do all drawers on the bases. He put heavy duty sliders on them so they can handle heavy appliances and my cast iron pots and pans. Best of luck! Having survived a kitchen remodel that became a first floor remodel, I have to say buckle up. I kept saying, “I’m glad were empty nesters and the dog died” so no one else had to live through it. The Brevelle Smart Oven was sanity. I feel in love again with my crock pot. I bought an induction cooktop and I liked it so much I went induction and not gas. My advice, contrary to the lucky person above who may have had the most brilliant cabinet maker ever, be prepared for more $$$$$ and more time. I always tell people who look at my kitchen to put your $$$$$ where your heart is. For me, it was appliances. I didn’t want fancy cabinets and saved money by using open storage which I have had in every kitchen since I got out of college. Know how you cook and your family lives. Decrease the number of steps between work areas and keep the traffic out of the cooking zone. While the kitchen triangle has been sacred, I think the work station concept works better for me—a coffee/tea area, a baking area, plenty of prep spaceI have open drawers in my kitchen and they are not those drawers behind doors…those are accidents waiting to happen! I opted for two ovens rather than an oven and a warming drawer and I don’t regret it. But with five children, I could see that warming drawer could be really useful. And don’t look back: 2 dishwashers!!! Definitely pay attention to the electrical plan, especially the switching…which lights you will want on separate switches, your path of travel, and where you will want to be able to turn the lights on and off. It’s a minor detail but can be super annoying if you don’t think about it carefully. A previous reader also commented that painted finishes can add to your budget, which is true with most cabinet companies (because the painting process is requires more coats than a stain). It looks like you are looking at painted styles (which I definitely love) but I’d also encourage you to look at alder cabinets in non-traditional stains. I’ve seen it done really nicely in taupe/gray/blue stains. It has a hint of visible wood grain but a totally smooth surface, and it can give a feel similar to a painted surface but with more dimension. I would also stay away from natural stone unless you’re using granite. I see a lot of people get hung up on the idea that they need a stone surface in their kitchen, but many quartz surfaces (though more expensive) look just like stone and are way more practical. If you go granite, explore honed and even leathered surfaces–they are a little unexpected but really pretty. A couple of other suggestions to save money on cabinet finishes. Don’t rule our foil finishes these days…it has come a long way and most have at least a 25 year guarantee. You can be creative with the type of wood and stain to keep the budget reasonable. If you have your heart set on a painted finish but don’t like the price, you usually can get your cabinets unfinished in a paint grade finish and have your own painter paint them. The major difference is that the finish won’t go through the catalytic conversion process so your finish is more susceptible to wear and tear (read dings and scratches) and you won’t get the factory finish guarantee. Woohoo!!! Excited for you! I grew up in a large family with a small kitchen, so I know the pain. Please blog every detail! You are my favorite blogger and I check every day. I, too, have a kitchen like yours and am waiting to reno mine. My pinterest board is already done and I’ve added some of your pins, which are great! I’m going to need lots of tips! Thanks for sharing! Our architect designed a walk-in pantry that also became my office. It’s one of my fave rooms in the house. I’m typing this in there right now. Bosch 800 series are the best dishwashers and don’t forget to also plan in 2 ovens. We have renovated four homes and the most important thing we have found is electric outlets everywhere and not the two plug but four plug outlets-especially the island. We were able to set up a second kitchen in our garage to make it through the renovation. It was so handy that when we did our last home, we planned an extra set of appliances in the garage. It is wonderful. I am really in love with floor to ceiling pantries for food and dish storage, This will be a wonderful journey for you and I hope you will share it with us. My daughter included a nice sized snack drawer next to the drink fridge. Its so easy for kids to access “mom approved” snacks with the proper size portions. It has made life a lot easier. We lived for 4 months without a kitchen while we remodeled ours. We had a fridge and a microwave. We used paper plates & plastic cups. If I had to do the remodel over again I would do all drawers on the bottom cabinets. I know it costs a little more but I think drawers are much more effective. Cannot wait to see the reveal! My thoughts are two dishwashers and a microwave drawer. My dear friend just put one in while doing her total kitchen remodel. I lust after it and she loves my pot filler. No matter what decisions you make if you keep looking at Pinterest and house blogs you will always see something else that you wished you had done. I do it every single day! Yay! Congratulations. I too have designed and built a few homes and/or kitchen reno’s. I organized my plan in these areas a. function b. style/aesthetics c. pure beauty . So that every decision had to follow the same rules…what/or how does it function, what is the style, is it beautiful? I happen to think cabinetry, tile, appliances etc. can all be works of art and pleasing to the eye. I do like my present kitchen that has a big drawer at my island that holds the cutting boards. I like the island to have little going on so that its size and materials is the focal point. One of my homes has a 12 foot island and the other an 8 foot. Both only have only a sink, which makes it visually appealing and so useful in food prep and big family buffet style service. I had two custom armoires built on either side of our kitchen doors; one is a stunning bar (with wine fridge) and the second my pantry (pull out drawers) and vertical tray storage above. They look like beautiful furniture, but when doors opened reveal beauty and function. I love open shelves, and I know you do too. This is the area that we can play with. I was in the restaurant industry for years and had commercial ovens. I now have an induction cooktop and will not go back to gas. They do not off gas like propane and natural gas, the elements do not get hot (you can leave a tea towel on it and it will not ignite) and it heats faster than gas. Love wall ovens!!! Love built in vertical storage above for pans etc. I customized my drawers so that my flour, sugar baking supplies had separate bins. I love the look and everything is organized into one “baking zone”. Also customized the spice drawers, cutlery drawers etc. I have always included a nook as well, money well spent in terms of socializing, kids, colour, and absorbing noise. I am in Florida for another month, but when I get home I will send some:) Love your sofa’s, great choice! Oh and ART! I always have room to hang original art! I never realized how much I would love having a warming drawer. We use it almost everyday! Pull out trash is great to have too. If you use a microwave and budget allows, I highly recommend a microwave drawer. As someone above said, you don’t need to bend down with a drawer vs. one with a swing door, and also safer when you lift hot foods just up and on the counter. A quiet dishwasher if your kitchen is open to the rest of the house, so that it doesn’t sound like a train engine is running for the duration of the wash. I would do drawers for all lower cabinets (for pot and pans/ small appliances/ platters, etc. ), as I find they’re a much better use of space then regular cabinets. We had a budget constraint back then at the builder’s decor centre, and now my hubby has to build our own pull out shelves for the lowers! It’s so exciting, though inconvenient, to live through a kitchen reno, but I”m sure it’ll be all worth it in the end, esp. when you’re designing it! I’ll be glued to your blog for updates! Have fun! I’ve never thought of a pull out microwave but I like the idea. I’ve noticed a lot of people putting them in the island now. Maybe that’s the kind they’re using?? I love my kitchen, and most of all, I love that everything is in drawers or drawers behind doors. Everything is so easily accessible. I also love my pull out trash and recycling cans — one behind the other. I don’t have a prep sink, and would love that. The one screw-up I work around but wish I could fix is that the smaller portion of our two-bin under-mount sink (where the disposal is) is very close to the wall where I don’t do prep work. It would have been great had that been reversed so I could just sponge the debris right into the smaller portion–but then again, I would be doing my dishes in reverse. Our layout is just weird there, but for what it’s worth… And I totally would love a warming drawer as well. So exciting! When we did ours, I bought those little baskets online that fast food places have and the waxed deli paper squares and used those for a lot of meals. We survived using our great big toaster oven (a must! ), microwave, electric kettle, refrigerator and bathroom sink. And takeout. We ended up putting our microwave in our island, on a shelf. Basically we had a 24 inch cabinet with the top 18 inches finished with an adjustable shelf, and a big drawer below. We put the microwave under the counter top on the shelf (we made it adjustable in case we changed microwave sizes in the future), below the shelf we put cutting boards, and in the big drawer below are plastic cups. We all love it there. My big regret is that I chose looks over function on the eletrical outlets on our island. I only put an outlet on the side facing into my kitchen, not out toward the family room, and it is so annoying because my husband and his laptop are always in my way now. Remember, function is key, I know I would never even notice the look of the outlet now! The suggestion above about putting a full size freezer next to a full size fridge is pure genius! Two of my favorite parts of my kitchen are my Kitchen Aid 6-burner gas stove w/convection oven and a pot-filler faucet above the cooktop, and also my pull-out spice drawer right beside the stove. No furdowns. Take those cabs all the way up baby! If you have a water line in the wall, go for a pot filler above the range. If you can do a six burner with a griddle, you wont regret it. Don’t waste your money on a warming drawer, just do a double oven under your stove and add a third oven in the wall if you need it. Take that akward nook that every kitchen always has and make a coffee station. If you use glass fronts in your cabs, add uplighting and glass shelves so the light goes all the way through, otherwise, only the top will be lit. If you chose carerra, (so gorgeous) it wears fine (despite what people say). Only problem are acids left on them for a long time, so if you get honed marble, that problem isnt a problem, as the acid simply dulls the shine, so if you dont have shine in the frist place, all good. (I will shut up now.) Good luck and God Bless! We’re undergoing something very similar right now! We’re expanding the existing kitchen and opening up walls so that the new kitchen will be open to the dining room and a new den (the former dining room at the front of the house). We’ll also get a mudroom out of the deal, too, and I’ll have my long-awaited and much-pinned corner banquette. We worked with an architect on the overall plan, then a Home Depot kitchen designer and we were very pleased with the design experience (our contractor will handle the installation). We’re going with KraftMaid cabinets – white shaker style with a navy blue island. The sink will be in the island, which faces the dining room. So, we’ll have a bi-level island with bar-height seating. This is key for hiding all the dirty dishes around the sink! We went with drawers for pots and pans, a pull-out spice rack, and a microwave mounted above the counter right next to the fridge. We skipped all the in-drawer organizers and will add them afterwards to save costs. The bench seat is built on cabinets for extra random, infrequently used stuff. Next to the bench is a cabinet/bookshelf combo for our cookbooks. Granted, my husband is the main chef in our family, but I’m always surprised by what he cares about. His big things were 1) being able to watch a big TV while he cooks, and 2) the cereal boxes must be stored right next to the fridge. Random! Large, side by side sub zero fridge and freezer- so nice to have more fridge and freezer space right there in the kitchen. Second sink not in island but on perimeter of kitchen or in butlers pantry- great to have another sink, but when it was in the island, it was always in the way and splashed the whole island counter and looked messy when we(or guests) sat at the island- one house we lived in had the second, smaller sink in the butlers pantry area, and that was so much nicer. If possible, do the remodel during the summer when it’s so much easier to be outside and to grill or eat lighter meals. Keeping the kids away from the construction dust and noise is far less painful when they can play outside. We renovated the kitchen in our last house about eight years ago with Kraftmaid cabinets from Lowe’s. Liked the cabinets, the service at Lowe’s was great, but the Kraftmaid service was so-so. When we renovated the kitchen in our current house about 18 months ago, we looked around at the semi-custom/big box stores, landed on an Ikea kitchen and couldn’t be happier. Our current kitchen cabinets from Ikea cost a little less than half as much as the Kraftmaid cabinets, and we have twice as many cabinets and even have a whole row of glass doors, tons of cool inserts and deep drawers for pots and baking dishes that we didn’t get on the first go-around. Also, the Ikea warranty is 25yrs vs 5yrs for Kraftmaid. Just plan, plan, plan and remember that you can customize an Ikea kitchen with non-Ikea items. For example, I have a super-sturdy corner base lazy susan from kitchensource.com that holds 50lbs/shelf instead of Ikea’s 26lbs/.shelf. (I have cast iron; I’m Southern!) I also got my double, super-deep fireclay farmhouse sink from Signature Hardware and couldn’t be happier. As far as the no kitchen for a few weeks, we set up a long card table with a microwave, a toaster and a toaster oven on it. Then, we put a plastic drawer unit and a few shelf units under the table and stocked our “kitchen” with paper products, spices, decent serving spoons/knives and just did a lot of freezer dinners supplemented with salads and fresh veggies and fruit. Not as healthy as homemade, but way better (and cheaper!) than eating out. Emily, you have such great style that I can’t wait to see what you end up with! Remember that the dust, hassle and fuss will be SO worth it!! 1. How many jobs will you be doing at the same time as mine? 2. I want the names of each of your best people in each category right now. I will be checking to be sure that best person is here working my job. 3. If you need to delay my job in order to have the best people, I want you to tell me. I do not want random people that you hope are good in my home. Only verified and trusted workers who are great at their job. Here is something else I learned ( too late): Viking’s reputation for amazing appliances is from years ago. Recently their reliability has gone down and their customer service is a nightmare. Also, I went with stainless appliances. But I kept my white subzero with stainless trim from 1995 it looks amazing in my new white kitchen and when it conks out, I am getting white again. So much easier to keep clean than stainless. This scares me :( But, thanks for the question list. The one thing I love about our kitchen remodel, and two bathroom remodels, is the fact that we only installed drawers. No cabinets to dig through! Two things I would do differently, are that I would have installed more outlets, including in the pantry ( nice to be able to recharge things in the pantry, and I would prefer to have a push button, thats flush with the counter, for the garbage disposal. All the suggestions are great but would add to make sure you have the soft close feature for doors and drawers. I do a lot of kitchen design work using Ikea and the soft close is a standard but I know with some of the other cabinet lines it is an upgrade. My personal design style is to have all tall cabinets together so plan to have the refrigerator, pantry and double oven cabinet lined next to each other. In my opinion it looks choppy if you were to put one of these cabinet in a run of base and wall cabinets. As others have said have a plan while you are without a kitchen. The renovation of a kitchen grows old real fast. You have to “keep your eye on the prize” is what I tell all my clients. All drawers for lowers, so much more practical than cabinets where things get lost in the back. Everything is accessible at a glance. Pull out trash drawer, ours is right below our cooktop and across from the sink which is super convenient. Soft close doors and drawer hardware. We put in double wall ovens and a 48″ cooktop and it’s so nice to have the extra cooking space, especially over the holidays. Vertical dividers above the wall ovens for cookie sheets and baking dishes. In drawer knife block and spice drawer. Those are the things I can think off of the top of my head. Seriously with the drawers though, a much better use of space! Drawers, drawers, drawers!!! I so miss the kitchen I remodeled in my Kansas house. Moved to Georgia to a builders idea of a kitchen. My designer made a small galley kitchen rock!! I so miss my drawers for my pots and pans. Forget cabinets on the bottom. She bumped out my sink on one wall and the oven on the other which just added oomph. Cabinets to the ceiling too, full overlay doors. And made my window bigger without losing an inch of storage considering everything else she did. Good luck, it will be awesome!! One more thing to add. My contractor put a “notch” in the wall behind the refrigerator. Counter depth look with a full sized fridge since it was recessed back. Genius!! I really dislike refrigerators sticking out into the room. I will never regret putting in 2 dishwashers or an under counter microwave drawer in the island that the kids can reach – I have 5 kids too. I also put 2 washers and dryers in the laundry room. Life changing! You’ve received so many good suggestions! Here’s some random thoughts based on experience over several kitchens. After living with dark granite, never again! A light colored quartz has been our favorite. Choose cabinets with minimal detail to simplify cleaning. For under counter lighting, look at LED. Avoid placing your primary sink in the island, choose a “farmhouse” sink (better ergonomics) but avoid fire clay. Carefully shop your dishwasher: Our appliance repairman shared that new dishwashers tend to be troublesome. Look at Rev-a-Shelf products. I love drawers in the base cabinets, but find that the double tier chrome pullouts by Rev-a-Shelf are more functional. The narrow space on either side of the pullout shelves are useful for cutting boards, wire cooling racks, etc. The Rev-a-Shelf pot/pan/lid unit is wonderful. Rather than having an appliance garage, we house small appliances in the pullout shelves beneath the counter where they will be used. We currently have a dual fuel range, with double ovens. I would rather have wall ovens and a separate cook top. Last, pantry storage for canned goods–mount shelves at an angle and store cans on their side. That one change in our pantry has been a total game changer! Cannot wait for updates! I second the Bosch DW. Ours had to be completely replaced at less than a year and we got a credit for what we paid for the original one. That did not cover what we had so we ended up with a lesser model and had to pay $125 out of pocket to replace one that was under warranty. The replacement does a horrible job of cleaning and all plastics have a gross film on them. So I bought it so that I could put plastics in the bottom in the first place and cannot wash any plastics at all in it without feeling like they are dirty. Never buying another Bosch product. I lived with a horrible kitchen for 32 years! When I remodeled in 2009, the footprint didn’t change, but I really analyzed how I cook and move in the kitchen. I eliminated the eat in kitchen table-we eat in the DR or on the small island and could eliminate one entrance to the kitchen. My priorities were counter space, drawers vs lower cabinets, pantry vs second oven, 6 gas burner range/36 in oven. I entertain and cook a lot. If I had more space, the only change I would make would be a second oven. The 36 in oven doesn’t work as well as 36 in cooktop and 2 standard wall ovens. If you have young children you may have different priorities. I love my 36 in Wolf range/oven, french door lower freezer fridge, a pull out garbage/recycling cabinet and all the cabinet space. Drawers, drawers, drawers! We moved into a house that has two dish drawers. I love them! No bending over. We usually just fill the top drawer, but we have the bottom one if we need it and can run a double load. We love our microwave drawer in the island! With all the technology being used now, I’d add some USB outlets to charge devices. I use my iPad in my kitchen while cooking so being able to keep it charged would be helpful. So exciting! I cannot wait to follow along with the progress during the renovation! Having lived through my parents remodel as a kid, I echo all the others who say camping kitchen – there are always mishaps that extend the timeline, so try to make it as usable and easy as possible! Also, if exterior walls are coming down, I’d wait for warmer weather to avoid water damage inside while exterior walls are open. 1. Thoughtfully placed outlets – we have several on the island for using the mixer, blender, etc without cords running everywhere, and in drawers, so you can charge your phone, laptop, etc out of sight. 2. Surfaces with easy upkeep – we all love carrara marble, but it stains and etches so easily. And let’s be honest, sometimes we just want to use a Clorox wet wipe and be done with it. We have quartz counter-tops that look very similar to marble, and a butcher block island, and both are so easy to keep clean. 3. Soft close drawers and cabinets – you have kids, so you can imagine how amazing these will be in avoiding pinched fingers. I can’t wait to see the finished product!! Things I love in my kitchen. Drop down drawer (it just kind of flips down so not sure if you would call it a drawer) underneath the sink for sponges & such.. Under cabinet lighting – crucial for any work on the counters. And double stack utensil drawers – awesome!! It’s going to be beautiful! There is lots of great advice listed above. There is a LOT of knowledge and information on that forum. It’s an adventure! Definitely agree w others who hint that you might need to double your time estimation (and add at least 20% to cost) – that’s what happens in renovation world ….. Insist your contractor obtain a permit – ours convinced us that it just added red tape and time – but we deeply regretted going along w him. Inspectors required by permit would have caught a big problem which is another story altogether …..
For survival, like others we used garage fridge and set up temp kitchen in dining room w 6 ft folding table as workspace – microwave, electric skillet and definitely a high power electric burner (to cook pasta, whatever )- these are not pricey- the sink is the problem- I hope you have a utility sink in your laundry room or garage. We did not, and that was the worst thing of all. As a designer, you surely will have the advantage over us non-professionals and know that if you have every single item picked out, ordered and delivered prior to any demolition, and timelines in your contract, And nearly every decision made, perhaps the project will go more smoothly and take less time. I’ve seen the full-size commercial fridge next to the full-size commercial freezer and it looks great. my counter depth refrigerator has been nicknamed the food display system-it does not hold much, or any large pots of things like soup or chili ….Thankful to have a garage fridge and freezer and we only have two children! I’m sure you already know that even if you have a contractor, you need to watch over everything and be the bad guy. Every day. All the time. And one day they will all be gone and you will have a wonderful new kitchen! Can’t wait to see yours ! Drink fridge…love it! So great to have when guests are over and then more room in the fridge. Touch faucet is amazing, ours is not faulty. Plus loving one huge, deep sink vs split. Drawers for plate storage with the peg system has been so great for kids to set the table. Charging drawer has also been great to have and opted for under cabinet plugs so outlets wouldn’t take away from my backsplash. I could go on and on…biggest worry and so happy I did it was brushed brass hardware! What I can tell you is that it will be longer than you think. We literally bulldozed the kitchen/summer kitchen from our 1881 farmhouse and added on a new kitchen ( and other spaces). We used contractors and also did some DIY. I was lucky enough to have a pole barn (our butcher barn) that we converted into a kitchen during the 9 month processs. Yes, I said 9 months! We’re still not finished, but we’re at least moved in and no longer cooking in a barn with below freezing temperatures. I complained ( a lot) but also know how fortunate I was to never have to do my dishes in the tub. 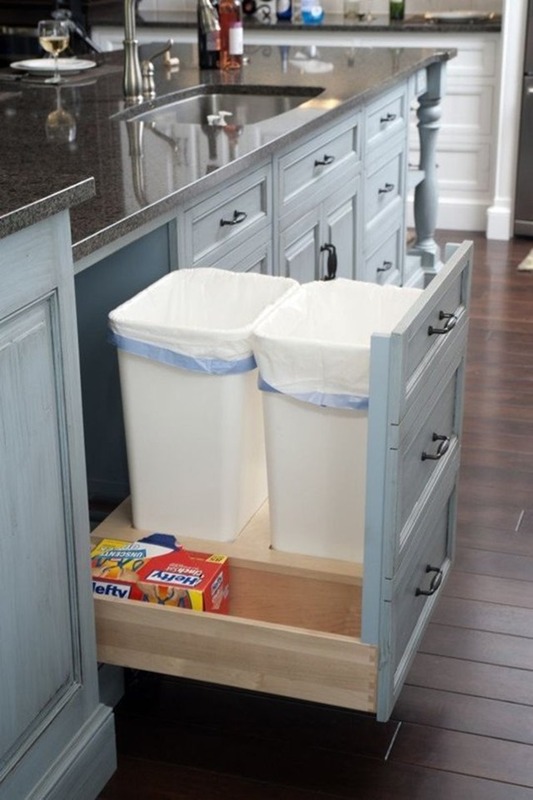 I have to say that a pull out trash can and recycling can has been one of my favorite things in my kitchen!! I could never go back to one sitting out in the room. And I have found with any kitchen project, small or large and lengthy, it’s best if the time without the kitchen coincides with grilling and dining on the porch a good bit. Or at least the grilling part. Another thought is finding one of the meal plans where you cook for a whole day and put 12 or 15 meals in the freezer. They could be heated in a toaster oven or microwave and add bag salad or fresh fruit. Good luck. I can’t wait to see it nor can I imagine how much a family of 7 uses a kitchen every day. Wow! Lots of good advice. My suggestion would be to do your reno while the weather is nice. You can grill a lot of food & set up a mini kitchen outside. You won’t want to be inside with all the dust anyways. Also, make sure you cover your heating/cooling vents to prevent the dust from getting into your ductwork. And can you share what you fed your husband to get him to agree to this? I would like to feed it to my husband. I just moved from a big house with a big kitchen that we remodeled 19 years ago to a small house with a kitchen that we just remodeled before we moved in. Things I miss are my double wall ovens, separate pull-out drawers for trash and recycling and my two full size refrigerators in the kitchen. Things I don’t miss are the huge space that had to be cleaned and the knife drawer that I stopped using years ago. Things I love about the new kitchen are deep drawers for the dishes, vertical storage for cookie sheets and baking pans, switch by my feet for the garbage disposal so you don’t have to worry about wet hands, counter depth refrigerator so it doesn’t stick out into the kitchen, massive exhaust fan/hood and giant 6 burner high-powered rangetop, and small shelves over the burners for salt, pepper, oil, also for warming plates. I thought it would be too hot to put stuff up there but it’s not. I wish I had gotten the flip down drawers under the sink. Also, you should look into getting an Instant Pot electric pressure cooker for the remodel, I got one for Christmas and I am obsessed. You can cook a lot of things in it. We are a family of six and love to entertain, so we need/use massive fridge and freezer space. The top item on my list is a full size fridge and full size freezer (Frigidaire’s professional line makes a nice set). Can’t wait to get rid of the “extra” fridge in the garage! Remodeled our kitchen a few years ago. 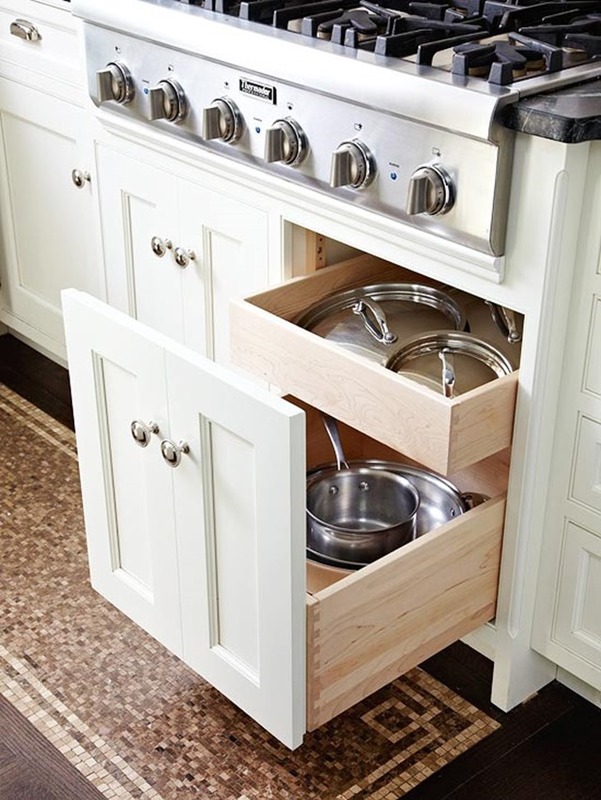 LOVE my deep drawers for pots and pans, double ovens, microwave above range top, garbage disposal, tall cabinet in pantry for mops and broom and smooth cook top. We put in granite counter tops, but if I had it to do over, I’d get quartz since you don’t have to treat them periodically. Also, my cook top is white and needs constant cleaning. Black maybe? might have been a better choice. We installed tile floors which look great, but I’ve already dropped a pot lid and something else and cracked two of them. Easy to do. Oh, yeah, if you are shopping for beverage refrigerators, make sure and get the food grade one. They are way more expensive but the cheaper ones don’t get your drinks very cold. We keep ours at 34 degrees and some of them only go down to 40-45. We like our beer cold! Haha “that’s a lot of sandwiches” killed me. I loved all these! Buying a home isn’t in the plans for at least 4 more years but I still pin obsessively over my dream home. Definitely pinning this to go back to because most listed are so efficient I would have never imagined. We remodeled a kitchen 4 years ago and just moved to a rental so we can gut and redo the kitchen and 2 baths in our new house (1917 kind of new), so I’m in the throes of it right now. Reading through your wants, I’m certain our kitchen is much smaller. I wish I could fit 2 dishwashers (6 kids)! Anyway, our cabinet maker suggested all deep drawers on bottom instead of cabinets with pull-outs, so we’re going with it. Makes sense because you really do lose space with the pull-outs. I second (or 3rd or 4th…didn’t get to read all the comments) Bosch dishwashers being the best. Oh, and the best decision we made in our last kitchen was to get the Frigidaire counter-depth all-fridge and all-freezer tied together with their trim kit to make it look “built-in” for WAY less. I panicked when I figured out they weren’t going to work in our new kitchen! I had to spend more only to lose space- wah!! Surviving without a kitchen? I’ve done it twice. Lots of eating out, bbq with a gas burner, microwave- the living room became the makeshift kitchen. Best wishes!! I made a FB page for our house renovation if you’re interested: Middlebrook Road Renovations. Thank you! Will check out your FB page. Just survived a kitchen remodel last year! I love the “soft close” cabinets. It was a splurge at the time but not hearing the slamming of kids is priceless and all the drawers are closed vs. being ajar. The instant hot water dispenser is also nice since we use a French press for coffee. I also like having all our electrical outlets hidden on the bottom of our upper cabinets so our pretty backsplash tile has a better effect. Good luck, can’t wait to follow your adventure! 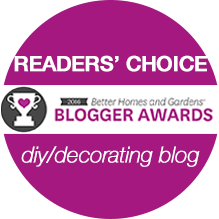 Emily, I’m so touched that such a talented designer reached out to readers to offer advise! Like I could possibly suggest anything to you! But I did remodel my kitchen about two years ago. For the most part I’m thrilled with all my choices. However, if I had it to do over again I would splurge on an apron sink. Also, I just replaced an electric range instead of going with gas which is what I wanted. We put a small prep sink in the island and although I’ve used it – I’m not sure the expense was worth it. I would also change out some cabinets for open shelves b/c I feel like my kitchen looks like cabinet overload. It would have broken things up a bit. I love my counter depth refrigerator, pull out trash can, knife drawer and wall pantry! Oh, and the soft close cabinets are a must! Hope you get lots of advise that you can use! I can’t wait to see what you do! We just moved to a new house. We have a microwave drawer under the cabinets instead of mounted on the wall. It’s easy to use and I like the look of not having it with upper cabinets. We also chose a wolf gas oven instead of a built-in oven and a cooktop and had a custom vent made for over the oven that looks great with the cabinets. A big change that I love is having drawers in my lower cabinets instead of doors and shelves. It is actually cheaper than doors with pull out shelves too. I do have some cabinets with doors. One thing I do wish we had done was lighting under the cabinets. We only did one area and should have had them installed under all the cabinets. Good luck with your remodel! You’ve received tons of fabulous suggestions already. One more to add to the mix is LIGHTING. Whether it be can lights, pendants, chandeliers, under cabinets, above cabinets, inside cabinets, inside a walk-in pantry, lighting to feature open-shelving …really take the time to carefully think through your lighting requirements. And make sure ALL of it, every single light source, is easily dimmable. A beautifully lighted kitchen (bright when/where you need it for tasks, warm and soft when you want quieter ambience for dining or entertaining) is a small luxury you will never regret. Ever. We extensively remodeled our kitchen and main floor with 3 kids 2 years ago and my biggest recommendation, which contradicts some of the others on here, is to do this DURING the school year so the kids are out of the house most of the day. Ours ended up running from mid-March to Memorial Day, and the one week they were off for spring break during that time was a.w.f.u.l. It was SO much easier for everyone (myself and the contractors) when they were out of the house. Because no matter how much you plan ahead, there will always be last minute decisions and errands that have to be run and I don’t know about you, but I’d much rather have those conversations when I’m not distracted or run around without dragging my kids with me. And I only have 3! Plus spring weather still allows for grilling, etc. – lower drawers with pegs for dishes…my kids can unload the dishwasher by themselves! Mostly importantly, know and love your contractor bc they will become part of your family for the time they’re working at your house. I can’t imagine doing that big of a job with someone I didn’t have a great relationship with. Good luck…can’t wait to see your progress!! We have a large basement laundry room with utility sink (and fridge in adjacent garage) that became our makeshift kitchen during our reno. With 2 working parents and 2 school age children I knew eating out frequently just wasn’t going to happen. This was the some of the best money spent on that kitchen! http://www.amazon.com/Hamilton-Beach-31104-Countertop-Convection/dp/B0083I7Q5I/ref=sr_1_5?s=appliances&ie=UTF8&qid=1452612594&sr=1-5&keywords=countertop+oven. Had to pull it out again when the brand new Viking went on the fritz for 6 weeks (avoid that brand if you can, they don’t keep parts in stock, everything is manufactured as needed). Good luck – I look forward to following your progress! We did a kitchen renovation when my kids were 2 and 6. We moved our fridge ad microwave into our living room and hired someone to cook dinners for us so we didn’t eat out all the time. Had to wash dishes in bathroom which I didn’t love but not a lot of options. It was kind of a pain to live through but so worth it when it was finished! We went form having a walk through galley kitchen to a huge kitchen that I still love 10 years later!! What fun this is going to be!! And how blessed are you to have a hubby that says “I hate our kitchen! !” ha! I’d jump on that one too! I think you’ve covered all the basis!! Can’t wait to see the progress! Thanks for all the great ideas, people! Def bookmarking this for (hopefully) later use. One thing I don’t think was mentioned: wherever you put the broom closet, make sure there’s an outlet inside so you can recharge items such as a stick vacuum. Hope you can enjoy the process, Emily! Thanks for taking us along for the ride. We remodeled our kitchen a little over two years ago. I love your inspiration pictures, as my island is now navy blue! One thing I did during planning that really helped was to make a list of every cabinet and drawer and their contents in the old kitchen, and a list of things I wanted to make sure I had storage for in the new kitchen. Then I went through the design and made sure I could get everything where it needed to be. We used KraftMaid cabinets (through a dealer, not Lowe’s–same name, different quality) and I love them. My favorite cabinet feature is the mixer cabinet. My stand mixer is on a shelf that lifts out. So much easier than lifting it out of a cabinet or closet. Our biggest change is no longer having a kitchen table. We widened the entry to our formal dining room (rarely used), made some changes so it didn’t feel so formal, and we eat in there every night. We had a half wall between the kitchen and family room, and that is now a second island (technically a peninsula, I guess). That island has a prep sink, refrigerator/freezer drawers (hubs and kids’ fave), and seating. The other island has no seating, and is just for me!! I have a mix of drawers and cabinets with pull-out shelves. I like them equally. I understand why drawers are popular, but visually I like a mix of drawers and doors. I would talk to your contractor about the possibility of not starting the project until all components are in and ready to be installed. Our actual construction time was three weeks. Seriously. And we moved a gas line, added/removed lighting, added a sink, and put new flooring in three rooms. All cabinets, appliances, flooring were in and ready before demo started. We have granite counters, and the fabricator pre-templated, so counter tops went in the day after cabinet installation was done. There was about a six week wait after we finished the design until day one, but it was worth it for a three week project. To survive–keep expectations low! The crock pot was my best friend. We lived out of our basement. These comments are a gold mine of ideas! Definitely going to reread when we get closer to doing our kitchen. The best idea ever that I saw in BH&G is a drinking fountain (old school porcelain type one) for kids, water bottles, etc. Definitely on my kitchen list! Good luck! Also – the lighting choice for over the island is important. These really make a statement in the room, so try a few out and go with what you love! We just did our kitchen. We managed by leaving the stove plugged in while things went on around it, and we also had an RV that we could use the kitchen in. But we really didn’t miss much for the time it was out of commission. Things we love: pull out trash and recycling, spice drawer, pull-out beside the stove for the oils and large bottles of spices, great lazy-susans, and lots and lots and lots of pullouts for drawers. One thing we did after we had the cabinets installed, not having purchased a counter-depth refrigerator, was to have our cabinet installer come back and move the cabinets out so that the front of the refrigerator was flush with the cabinets. We simply built the wall out that the other cabinets were on – it was the shortest wall in the room, and so we don’t feel like we lost any space – but you would want to do that before you had your countertops measured, that’s for sure. and we sourced our cabinets from Costco and they are some of the best cabinets we found. Exceptional quality and, if you purchase in-stock cabinetry, crazy fast delivery. And we bought all our pulls, knobs, etc. from Restoration Hardware – more pricey than the home improvement stores, but I consider them the jewellery of the kitchen and well worth it. This sounds like so much fun. We just remodeled our kitchen 2 months ago. We went with a built in trash compacter. I had a double pull out trash can and was still emptying the garbage every other day. Now its once a week. Why don’t more people use them? Also Miele is a great appliance line. We went with the large built in fridge with water and ice in the door. So nice to get a drink without opening the doors. Bonus: company doesn’t have to go into my freezer for ice anymore. One thing I would never do again is put drawers inside a cupboard. I would just make large drawers. When drawers are inside you must open cupboard door 1, open cupboard door 2, and then pull out the drawer 3. It is a huge hassle! If you have drawers only you just pull it open to retrieve your item. I step instead of 3! A huge time saver! Haven’t done a kitchen reno (yet), but when I do an ice maker may be the number one item. We have four kids who play sports and we live in Texas. I can never keep enough ice on hand with just our fridge/freezer and it makes me crazy to have to buy ice! If your kids are into sports, it’s something to think about. We had a bank of drawers in our last kitchen that was nice for things like cutting boards, towels, pot holders, etc. That pantry you have pictures above for dishes storage is AMAZING! We just finished a kitchen renovation (we did it ourselves, so it took longer than usual — we were without a kitchen for 9 weeks total) and here’s a few things I did to insure I would be happy with the result. This might seem a little OCD, but I literally made a list of everything I needed/wanted to store in my kitchen. Pots and pans, tupperware, appliances, plates, dishes, garbage cans, etc. Then I figured out HOW I wanted to store them. In a drawer? Pullout cabinet? I went with a lot of drawers instead of the traditional cabinets because it makes it SO much easier to see everything and have instant access. Then I started drawing out configurations of cabinets based on the new footprint we decided would work best. I worked through many, many options and imagined cooking, entertaining, etc. to see if they would work. Like I said, kind of OCD, but I finally have a kitchen that I enjoy cooking in. Everything has a place and even my kids know where everything goes. As far as living without a kitchen for that long — I admit it isn’t great fun, but it can be tolerable if you have a system. We set up a “camp kitchen”, as it has been called in some of the other comments, and it helped a lot. I used our George Foreman grill & crockpot a lot. So, I guess my advice boils down to this. Don’t rush into a huge renovation like this until you’ve planned and planned and planned again. Imagine yourself cooking in the new kitchen and where you are going to plug your blender, toaster, etc in. 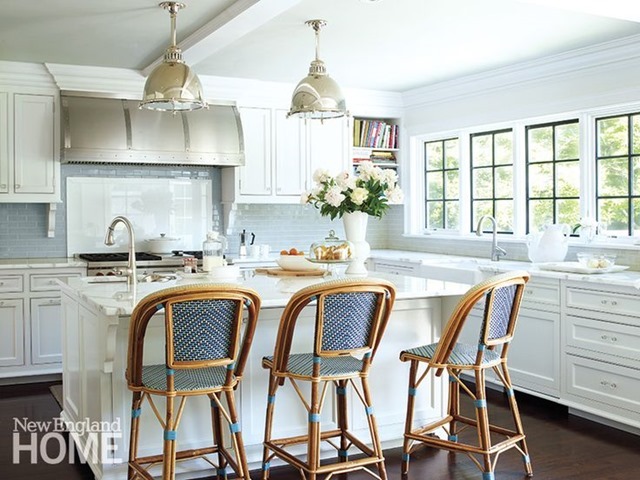 Imagine where your kids will be sitting while you are cooking — I love have barstools on the backside of the island so my kids can be right there, but not in my way! Also, this seems totally obvious, but it is amazing how many people don’t do this — make sure when you plan your storage, it is stored where you actually need it. Your pots and pans next to the range, your plates, glasses, silverware, etc. right next to the dishwasher. It makes a world of difference. I actually have my silverware, plates, glasses and bowls in deep drawers next to the dishwasher. My husband thought I was nuts when I first told him my plan, but now he agrees it works really well. No more unloading the whole dishwasher onto the counter and then scurrying around everywhere trying to put stuff away and hoisting huge heavy stacks of plates into high cabinets. Unloading the dishwasher is not a dreaded task anymore. Anyway, sorry for the novel. Good luck and enjoy the ride. It really is awesome to create your ideal kitchen from scratch! After a complete kitchen remodel I can’t emphasis enough about replacing bottom cabinets with deep drawers. Especially under a cooktop for pots and pans. Also love our quartz countertops. We were able to use our former dishwasher as a backup in the laundry room. I still want an extra dishwasher but in the meantime, for our family of 8, the bosch dishwasher has been a good substitute. It has the third rack for silverware so it fits a ton! Plus it’s super quiet. Love it! Good luck!! How exciting Emily! I’m sure you will design a beautiful kitchen! Taking a look at every single thing inside your cabinets and then figuring out a real place for them in the new layout is super helpful down the road…..and for deciding what you can and can’t live without! Having 2 dishwashers is the BEST thing ever for your new kitchen. We recently added a second one and I don’t know how I survived before! You will love it! My five kids are grown and we are empty nesters. I am pretty level headed and weather things pretty well but we are only three days into ours and I have already had a meltdown today. I am ready to just go back to where we were and have some peace back in the house. Is your kitchen THAT bad? My husband does all of our updates, a blessing for saving money, not so much when the work is only on the weekends and in the evenings. We started demo in February and we were completed on June! We should have been completed in Late April, but we hired a contractor to put in the cabinets since a friend who was going to help my husband had a family crisis. The contractor also ordered our cabinets since he had a distributor that would save us some money. The cabinet for our cooktop got missed and then ordered wrong and that set us back 8 more weeks. I was also pregnant with my 3rd. My granite was placed 3 days after I delivered. All in all doing dishes in a bathroom sink was the worst. Otherwise, we were able to move our fridge to the dinning room and put up tables to be our new kitchen, our front room (formal living room) turned into our dining room. Even through an Ohio winter, I grilled a lot! I used the microwave to steam veggies and boil noodles. Good luck! Also I am sure you know as a designer, but we would told to use the same company for all of our appliances, since each company has their own stainless color and sheen. We have been very happy with all of our Kitchen Aid. I also would recommend an Induction Stove top, no scorching when water boils over, easy to clean, literal less than 1min to boil, LOVE it!! A couple of things…we set up a makeshift kitchen in our laundry room.i had a microwave, a sink, a frig, shelving, counter top spac, a crock pot and an electric skillet. Had it gone on much longer, I would have added a hot plate. We grilled a good bit including veggies and pizza on the grill. We had a blast and look back now at that time as the fun challenge it was. I fired the first cabinet person and that was the best thing I did. We weren’t quite seeing eye to eye in the planning stage and the day I let him go was the day the experience became fun again. His replacement was the key to our success. Were I to do another, I would strategically hide more electrical outlets. I would plan them around how you will chop, blend, bake and entertain. I would make the chopping, prep area close to the double pull out garbage while making it accessible to others needing to get to that space at the same time. When you read 36 inch walkways, add at least 4 extra inches. Yes to the warming drawer. Yes to a convection microwave. 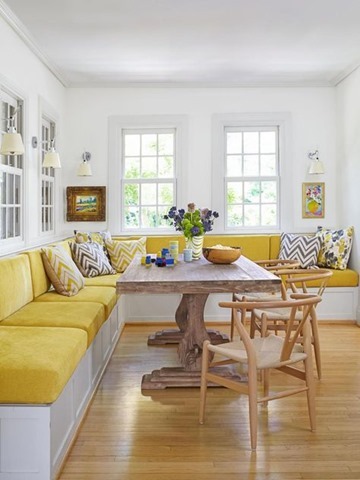 Yes to two dishwashers, yes to a cozy banquette corner. Yes to some glassed and lighted upper cabinets, yes to soft close and as many pull outs in lieu of regular shelves and most definitely yes to true counter depth refrigerator. I saw a pin with a broom closet at the end of a wall of cabinets. I would definitely add that with enough room for a small vacuum and include an outlet for the battery recharge. When we lived overseas last, or kitchen didn’t have lower cabinets. Rather, there were very wide, counter depth drawers – 3 across and another set below (no doors with pull outs, just giant drawers ). I could put two stacks of dinner plates, my cereal bowls, and stacks of salad plates in one drawer. I had a baking drawer with all my flours and sugars and bowls, etc. It was glorious and if I ever get to design a kitchen, this is what I’d include. For a family your size, the full size fridge and freezer is probably a good idea. However, I really love having our second fridge/freezer out in the garage. That’s where we keep all of the kid and adult beverages, extra frozen food, etc. I like it out there because it keeps the kids from running in the house every five seconds to get a drink when they’re out playing. Definitely go with as many large, deep drawers on the bottom as you can. You just lose so much storage space in the cabinets. With a large island that I love in between my sink and stove, I wish I had a pot filler at the stove. I personally see no need for a prep sink in your island, especially if you want seating around it. I would also design your island to have cabinet/drawer access from both sides (either cabinets go all the way through or divided in half so you have shallow cabinets/drawers on each side). Place your electrical outlets as close to your countertops as allowed (or under the cabinets) so they can more easily be hidden and don’t visually distract from your beautiful backsplash. Think about a landing area (not necessarily a whole desk) where keys, mail, phones, etc. can land/charge each day to keep them off your big gorgeous island. This is a CONSTANT battle at my house. We even have a dedicated charging cabinet in the mudroom for all that crap, but for some reason everyone wants to empty their pockets on the island where I’m trying to cook dinner! We re-did our kitchen and painted the bottom cabinets Hague Blue (Farrow and Ball), and I love it! I recently stumbled upon your blog and have since convinced my husband to start redecorating our home because we loved your style so much. I wanted to first say thank you for having such a lovely home as inspiration for all of us decorating-challenged individuals out here. Secondly, although I have never renovated one of our homes before (we’re a Navy family so we move and rent A LOT) , last year I helped my parents with a full-house renovation, including a kitchen overhaul. So I’m hoping some of my tips we learned along the way will be helpful to you! 1. For starters, the saying is true: expect to spend double the money and double the timeline. For some reason, kitchen renos never seem to play out on time nor on budget so be well prepared for that with crockpots, electric griddles, toaster ovens, and camping stoves in your garage. It will be tough to adjust to, but a lifesaver if you truly are going to dive into as deep a reno as you’d like. 2. Have you and your husband draw up your own plans of what you want the layout to be. A contractor cannot plan out your kitchen how you know your family will use it no matter how skilled they are. Once you have your plans drawn up, you’ll be able to accommodate for outlets, corner space, ample counter space, storage, etc. 3. Do as much of the demo as you-safely-can. It will save you some money and it’s always fun to smash a few things in the process, or donate as much as possible for someone less fortunate to reuse. 4. If you’re going to do a drink fridge, maybe plan a separate wet bar area to display nice stemware and hold all of the adult drinks as well. Sometimes this makes for a good transitional area between kitchen and living spaces, and may draw guests into the kitchen while you’re cooking. 5. Weigh out the pros and cons of having a vent hood vs. a microwave with a vent fan. If opting for the vent hood, make sure you leave space somewhere for the microwave to go, up off of the counter, so you don’t lose any precious prep area. 6. A double oven. After hosting your first holiday meal, you will be glad you did it. 7. Under cabinet lighting with brightness adjustment if possible. This can help set a mood, or simply be helpful to add more lighting. 8. My mom’s biggest regret: not putting a retractable arm pot-filler faucet above the stovetop. She chose not to have one because it seemed excessive, but after time went by she regretted not putting one in when she had the chance. 9. Plan for ample natural light during the day and plenty of adjustable brightness lighting for the evenings with separate switches. make sure you have a light above your feature areas so that when entertaining, guests are drawn to what you want them to see (like the food) and ignore what you don’t (like maybe dirty dishes). 10. A french door fridge will become your best friend. Now that they make ones that are fingerprint resistant, it will make cleaning so much easier. 11. On that same note, consider dishwashers that have a cabinet face, instead of the regular appliance face. This will allow a more uniform appearance in cabinetry and again, one less surface to show water stains and fingerprints. 12. A walk-in pantry with deep shelves. With 7 people, I’m sure you could use the storage space for food and other miscellaneous items. 13. At least one outlet on the island. If you can plan for it to be tucked up under the counter top, even better, but if you don’t put one in, I guarantee you’ll regret it every time you cook or bake with the kids at the island. 14. Pay attention to the depth of the counter tops compared to the upper cabinets. My parents tried to have deeper upper cabinets, but didn’t realize that would inhibit how much counter space they had left to work on. 15. Finally, DON’T SETTLE! If you are going through all of this work, headache, and money, make sure you are getting exactly what you want. If something isn’t correct, have it fixed right away. If you aren’t sure about something, ask a question. Your contractor will be working for you and you have the right to make any changes you see fit because you are ultimately the ones paying for it. With all of that being said, I hope your reno goes smoothly and I cannot wait to see the progress and final product! Good luck with everything. Hi Sydney, thanks for all of the great advice! I especially agree with #15. It’s now or never! I got your email newsletter today and am commenting on the dark counter tops. I just put in counters that dark with our kitchen redo. I have had them 2 weeks and am quite surprised at how much shows up on them. Grains of salt and every single crumb just sit there a scream to be cleaned up. I went from very light counters that showed marks from everything that touched them and was so excited to get rid of them and had no idea that I would still have a similar problem. That said, I love the look of the near black in my kitchen and would probably go that dark again if I had the choice. Hi Emily, I loved your video! I was unable to comment on it (maybe because I watched it too late?) but I wanted to tell you that we have Silestone quartz countertops and I love them. Beautiful – I get a ton of compliments on them – and indestructible. No one has time to be messing with anything that’s a lot of work to care for, especially when we’re moms. I also have a kitchen corner optimizer. 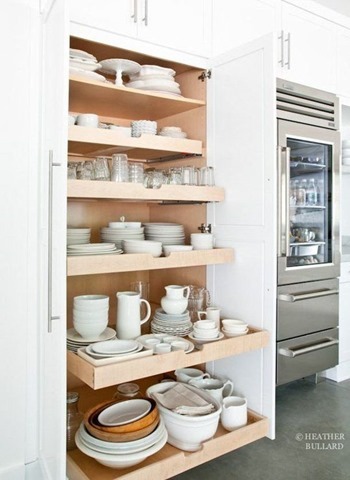 I like it better than a lazy susan because things can’t fall behind it as in a lazy susan cabinet. I’m not being spammy, but if you want to see mine, this is the link. http://www.mbzinteriors.com/?p=49 All the Best to you and I look forward to seeing more videos and your kitchen. So exciting! Not spammy at all :) Neat solution for the corner. Thanks for sharing. We lived through a remodel with our refrigerator in the living room, etc.! 1-I like that you use color! 2-One thing I added that I haven’t noticed (forgive me if you already have them in mind) is a cutting board that pulls out above my trash can. So I can pull out the cutting board and cut on it (I only cut veggies and bread on it; I use another cutting board for meats) and scoop the unusable parts into the trash can pulled out below. Love it. I bought a Boos block and had it cut to fit. The other thing I did not notice is a spice pullout beside my stove. Very handy. I wanted a paper towel holder in place of a drawer, but it didn’t work out. (hope I described that vividly enough). We love our two drawer dishwasher. If space is a concern, this is the best of both worlds.